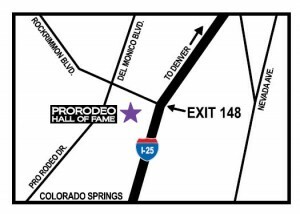 The ProRodeo Hall of Fame and Museum of the American Cowboy is located in Colorado Springs, Colorado, near the foothills of Pikes Peak. Access is directly off Interstate 25 at Exit 148, at Rockrimmon Boulevard. Colorado Springs is 55 miles south of Denver, in the Front Range of the Rocky Mountains. Airline service is available into Colorado Springs Municipal Airport and the Denver International Airport. Rental car and taxi/bus services are available. We offer discounted rates for school groups and groups of 14 people or more. Call (719)528-4764 to book your group today. Guided tours of the Museum are available on weekdays only. Please call in advance to book a guided tour.